As soon as I noticed Healthspek was located in the Nashville area, I decided to collect more information. I emailed the public relations person listed in the press release. The next morning I got a call from Bruce LeFew, the COO of Healthspek, who invited me to meet with him and Randy Farr, the CEO. 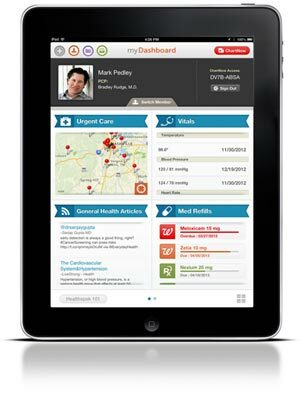 Healthspek is a free app that manages all personal and family health information in one secure place, accessible from multiple devices anywhere in the world. The unique myDashboard helps consumers manage medications, track vitals and access care. Users can also record physician, insurance and emergency contacts, a personal photograph and even a signature, as well as allergies, medical charts, legal documents and more. The myInbox receives medical records and facilitates electronic communications with providers; with the patient’s permission, doctors can access records through Healthspek’s www.chartnow.com. Healthspek is an outgrowth of the work Farr and LeFew had previously done in helping physicians get their medical records online. This app is available free to consumers on a number of popular platforms. PGT is not a test that informs you of specific mutations such as BRCA 1/2. 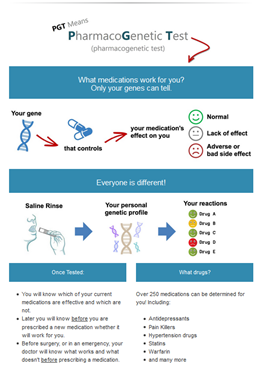 Healthspek provides results of 12 genes that affect drug metabolizing. Healthspek’s PGT is designed to test genes that help produce the enzymes in your cells that metabolize medications, drugs, and supplements. This falls under the category of medicine commonly referred to as precision or personalized medicine. Those 12 genes are listed below. Depending on when you tested there, 23andMe may have tested different SNPs. I took my first 23andMe test in late 2009 as part of their beta test. I have one extended family member whose results just came back in the last couple of weeks. If you have had a 23andMe test, you have had raw data for some of the SNPs tested on each of these 12 genes to be tested by Healthspek. In this partial example above, 23andMe has reported data on 19 SNPs on gene ANKK1 at some time over the last 6 years. In my earlier test raw data from 11 SNPs were reported. Last month raw data from 15 SNPs were reported. Raw data from only 7 of these SNPs were reported for both tests. The astute among you have noticed that I have not filled in all the boxes in the chart above. That is partly because I wanted to get this blog posted before I leave for a research trip to Salt Lake City. My rationalization is that you really would not be that interested in my results. If you have tested at 23andMe you would want to check your own results and see how many of these 1,141 SNPs on the 12 Genes listed in the left column actually had results reported to you. You can find this out for yourself by opening the drop down menu under your name in the upper right corner of the opening page of your results report. Then click on BROWSE RAW DATA. Next enter each of the 12 Genes, one by one, in the Jump to a gene box. Your number of SNPs tested on that gene and your actual genetic results will be returned to you. I do plan to finish filling in the boxes in my own chart above in due course. Farr and LeFew promised to send me a list of the all the SNPs on those genes that are tested by MyGenetx, the CLIO accredited lab used by Healthspek. If I get that list, I would like to make a detailed analysis of how much overlap there is between the results that 23andMe provides for $99 and Healthspek provides for $495. Then a more direct comparison can be made of the two tests. In fairness these products are not same. Healthspek offers a 15 minute telephone session with a genetic counselor as part of the package. In addition, interpretations produced by Translational Software of the genetic findings are provided. Translational Software " transforms raw test results into actionable reports that clinicians can use to guide therapies toward the safest and most effective treatments" according to its webpage. Healthspek seems to have an interesting bundle of products to offer. Will physicians order the PGT? Will insurance companies pay for it. Physicians in clinical practice need assistance in applying genetic data into improved patient care. Personalized medicine is possible now if all the pieces of the delivery system can be synchronized in a cost effective manner. All this begs the question raised in the recent MIT Technology Review article brought to our attention by Richard Hill. In it Antonio Regalado asks "How much would you pay to know your genetic code?" He then suggests many new startup companies are willing to lose money to find out.